Charmoula is a Moroccan marinade made of herbs, oil and spices. This appetizer is simply outstanding. 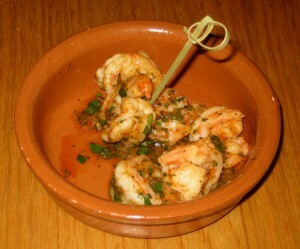 The shrimp is juicy and flavorful. The charmoula was comparable in taste to pesto sauce. We could eat a couple bowls of this one and is on the happy hour menu too! 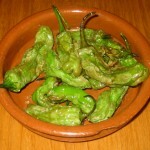 Padron is an area of Spain where these peppers are fried and served with olive oil and coarse salt. Fino stayed true to its roots and served them in a similar fashion. 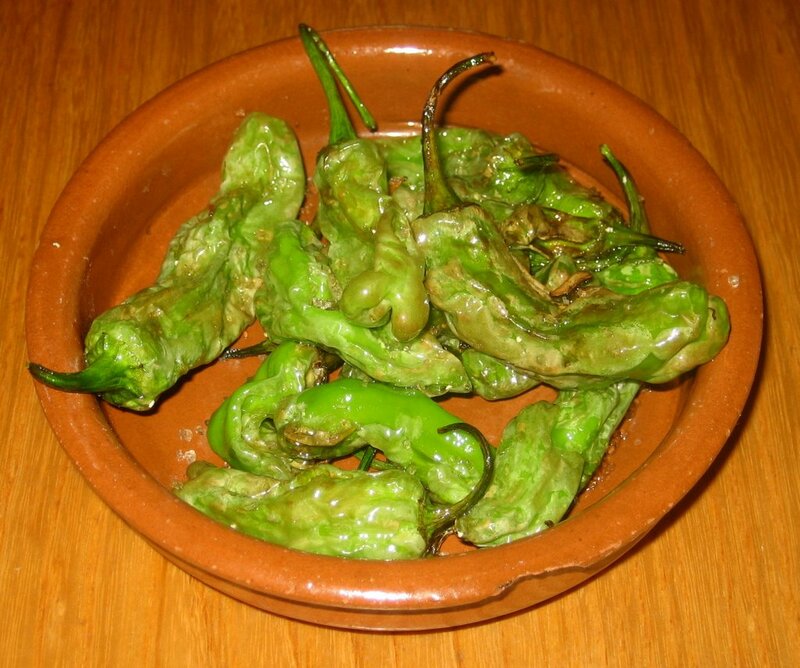 Some of them tasted tame, while others were a little spicier. We found the salty taste overpowering and took some of the salt off. They were also too oily. With fideos parmesano (angel hair pasta), scallions & garlic aioli. We ordered this one with apprehension, due to our disappointing experience with the lamb chops at Aquarelle. Well, this may sound cliché but the lamb fell right off the bone. It was very soft and tender, and we were impressed by the amount too. 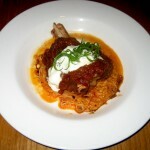 The Romesco sauce is mild and slightly nutty, but pleasant. The pasta complemented the meat well and was cooked nicely. 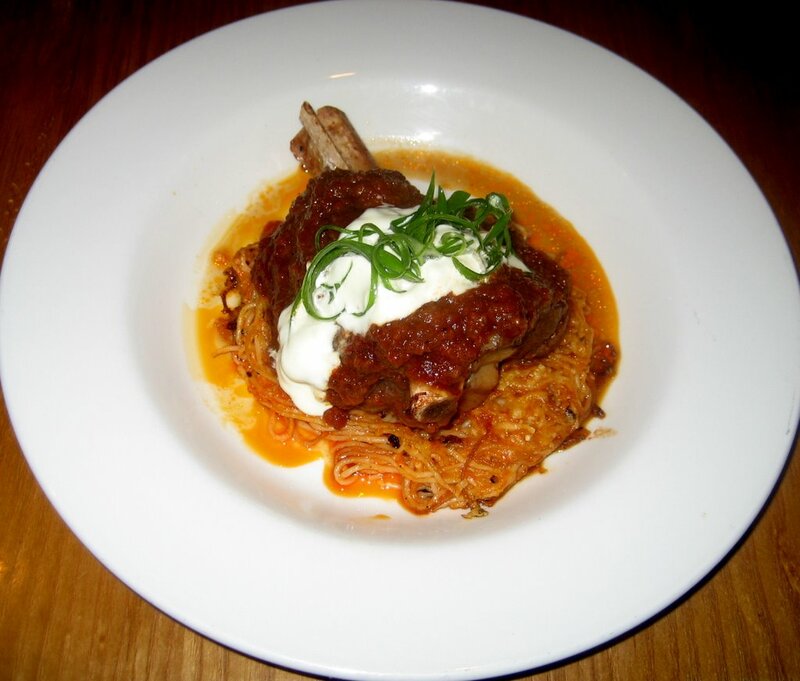 Fino’s chefs made this lamb shank a very enjoyable entrée, and we’d order it again. 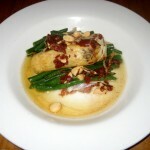 With Serrano ham, green beans, brown butter and Marcona almonds. 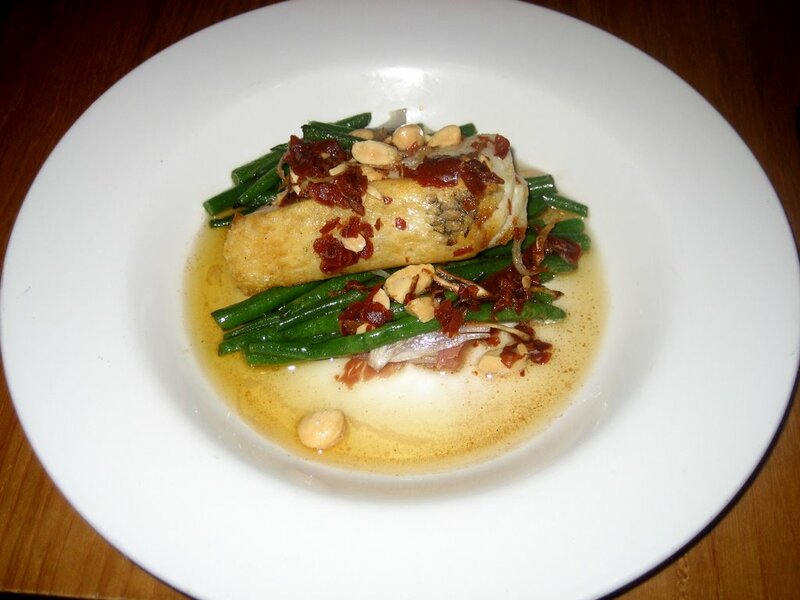 The sea bass is crisp and flaky on the outside and succulent on the inside. The brown butter really comes through, and the almonds on top added a nice crunch. There wasn’t enough Serrano ham, but when we had a bite of it with the fish – it was yummy! Also noteworthy – the bass sat on a big bed of beans. This isn’t the kind of place that will put just three green beans on the side of the plate as decoration. Every element of this entrée was carefully thought out because they all harmonized together. 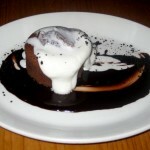 With vanilla cream and cocoa-espresso sauce. This little cake is lovely. Normally we don’t like espresso flavored desserts, but this one is an exception because there is only a hint of espresso in the sauce. The cake is soft, warm and almost melts in your mouth. The cream didn’t do much for us as we would have preferred some ice cream. The service here is on point. We made reservations and the sweet hostess seated us immediately. Because it was our first time there, they gave us a sherry to drink while we ordered appetizers. They also brought out one of those tiny complimentary snacks – which is another sign you are at a classy restaurant! Our waitress was friendly, chatty, and knowledgeable of the menu. We never felt rushed and she answered questions thoroughly. During our meal, she was attentive without being overbearing. I called beforehand and asked if they could put a candle in the dessert but they either forgot or it was lost in passing down this message. When I found our waitress and asked if they had a candle – she said they would bring it out in a scoop of ice-cream for the birthday boy! 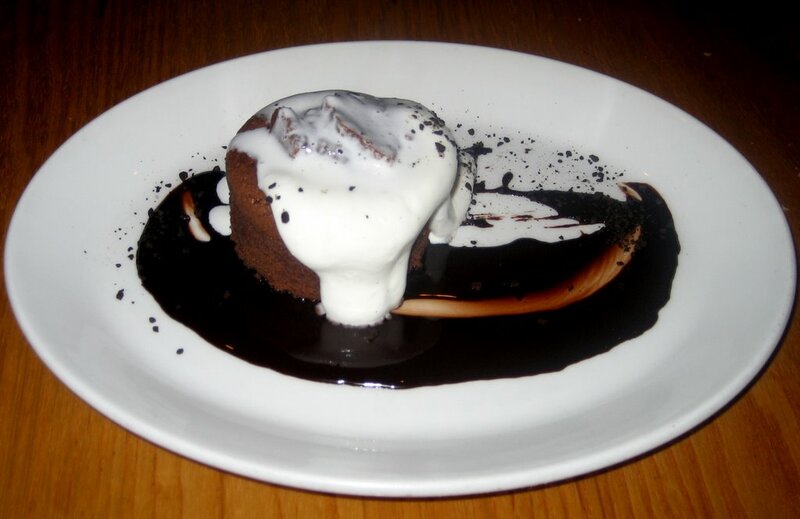 They also said the dessert would be complimentary. How gracious… this restaurant is definitely tops for service. Fino is tucked away in a small shopping center, and complimentary parking is available in the adjacent garage. It has a large, covered outdoor patio/lounge and two dining rooms inside. One room is slightly quieter, more formal, and may be more suitable for couples. The other side is a little noisier and could be better for groups. The interior has table and booth seating available, but keep in mind the tables are rather close together. There is a large window that lets a lot of natural light in, and low-lighting for when it becomes darker outside. This restaurant has a trendy vibe but still remains somewhat contemporary/casual. It is unexpectedly charming and appears to be one of Austin’s hidden gems. When you consider the fabulous service, great food and hip atmosphere – it explains why Fino was packed on a Friday night!